With his passion for all things cycling, attorney Frederick M. Dudek frequently commutes to his San Diego law office and participates in many cycling events to fundraise for charity. From seasoned professionals to those who ride every now and then, our attorney created this list of must-know cycling tips. He based it on knowledge he gained from his own love of cycling and as an experienced lawyer who handles bike accidents claims. If you are a current bike commuter or considering this option, then the following suggestions may help you avoid a bike accident. Plan and practice your route before you cycle. The fastest and most direct route by car may not be the best for cycling. For example, crossing a freeway at a less busy on/off ramp is worth the extra distance and time if you avoid a bicycle accident. Practice your ride on a weekend or time of day when traffic will be less busy. If you find that traffic begins to pick up on your normal route, then try modifying it or try a new one. From experience, taking the “road less traveled” may allow you to discover a more scenic ride, smoother roads, less traffic or a great coffee shop! Take notice of inexperienced motorists and cyclists around you. Every new school year, young inexperienced drivers on their way to and back from high school flood the roads. If you commute or cycle frequently, then you can take steps to avoid the routes near school parking lots when students are coming and going. However, cars are not the only dangerous force on the road. Be extra cautious around cyclists who appear unsure of their riding abilities or violate the rules of the road. Always wear a helmet and use appropriate cycling equipment. 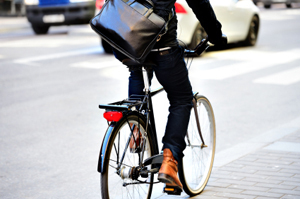 For adults, wearing a proper and well-adjusted helmet may prevent serious or fatal bike accident injuries. California law requires children under 18 to wear helmets. If you wear long pants, then tie the cuffs to keep them away from the chain. If you may ride at dusk or later, then wear reflective clothing and use proper lighting. The law in California about cycling at night requires the use of rear and side reflectors, pedal, shoe or ankle reflectors and a white front light (California Vehicle Code section 21201(d)). Obey traffic laws and cooperate with all vehicles as well as vulnerable users. 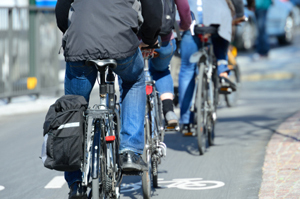 Cyclists have most of the same rights and responsibilities as motor vehicles on California streets and highways. Laws regarding traffic signals, stop signs, turns and other rules of the road apply to cyclists. Do everything you can to make sure cars know where you are and where you will be. This includes riding predictably in traffic. Avoid sudden movements, which brings you closer to traffic and increases the odds of an accident. Slow down around pedestrians, especially children. Make a plan for expected problems and prepare for emergencies. If you cycle frequently, then you know a flat tire will happen sooner or later. Always carry at least one spare tube and pump (or air canisters). Be prepared for a change in the weather. Carry extra cycling clothing or leave a rain jacket at work. Planning for mechanical problems and weather changes can decrease the odds of your involvement in an accident. Keep proper lighting with you or at the office, in case you need to work late. Always carry a cellphone with you for emergencies. It is also a good idea to carry identification, your health insurance card, medical information (such as blood type) and a card that identifies who to contact in case of emergency. Do I Need an Attorney After a Bike Accident? As a cyclist himself, our bicycle injury attorney is in a unique position to know firsthand the type of legal representation cyclists can benefit from most after an accident. If you or a loved one gets hurt in an accident, we may be able to help you. This includes collisions with another vehicle or dangerous roadway conditions. 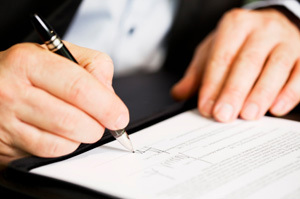 There is no financial risk for seeking a lawsuit due to our ability to take your case on a contingency fee agreement. Unless we are successful in gaining a favorable settlement or verdict for your case, you do not owe any attorney fees. If you would like to discuss your legal options with our lawyer, reach out to our firm. We can also provide more information on California cycling laws. You can call (858) 530-4800 today to schedule a free, no obligation case review.